Today, we announced the introduction of new benefits for Business Prime, an annual membership program designed for Amazon Business customers. 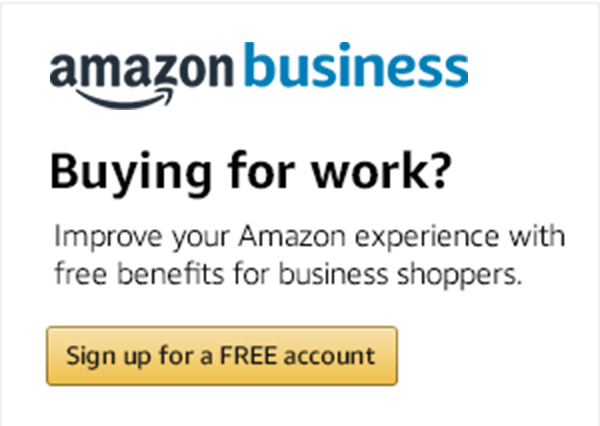 While the program offers many important benefits such as fast, free shipping for your entire business account, I want to tell you more about two important, new benefits designed for organizations with multiple buying employees - Amazon Guided Buying and Amazon Spend Visibility. In a nutshell, Guided Buying lets you configure the Amazon shopping experience for your business specific policies and capture more of your spend with Amazon Business. Powered by Amazon QuickSight, Spend Visibility enables you to gain procurement insights into spend by department, category, supplier, and month, and fine tune your policies to manage future spend. You can take advantage of the broad selection available at Amazon Business while retaining business policy control and gaining deep insights into the spending patterns of your business. Keep reading for more details on how these benefits help you modernize your procurement practices and bring them into the 21st century. Or, if you want to get a jump start on trying them out, visit the Business Prime page and get started today. This question intrigued us. At Amazon, before we embark on any new initiative, we start with the customer and work backwards. We held deep dive discussions with VPs, procurement managers, teachers, and everyone in between. The customer stories we heard were consistent across a large and diverse group of Fortune 1000 customers who were frustrated with the legacy systems they had that restrict choice and competition. They were ready for something new that could blend the ease and shopping convenience of Amazon with policies and compliance rules specific to businesses. This type of feedback from customers helped plant the seed that would become Guided Buying. Our product and design goals were clear: we were going to enable business customers to tailor the Amazon selection and shopping experience to their specific business needs. We knew we needed a simple and easy-to-use administrator experience where the policy owners could add users, organize them by groups, and set up procurement policies that clearly identified which products and suppliers were preferred or restricted by the company. We worked with multiple teams across Amazon to devise an improved shopping experience for businesses that would help buyers comply with policies from the get-go. In this new shopping experience, when a business buyer wants to buy products, Guided Buying lets an account administrator highlight preferred products so as buyers search for products, they will see icons and messaging that guides them to company-preferred products (see Figure 1 for an example of Preferred Product highlighting). Similarly, if what buyers are looking for is a company restricted product, they will see clear messaging informing them why the product is restricted. In addition, if suppliers that you have existing contracts with are selling partners on Amazon, you can use Guided Buying to make them preferred suppliers, and guide users to buy from them. You can also direct a portion of your spend to suppliers with Local, SMB, Minority, Women, and/or Veteran credentials. Once you have selected your suppliers and set up your policies, you can open up Amazon Business to all of your employees. Your users will get the Amazon shopping experience they love and as they shop, Amazon will provide visual cues during the shopping experience that reflect your business policies. Our customers also told us that we needed to provide them with procurement analytics based on order history and spending patterns. This is why we built Spend Visibility. Powered by Amazon QuickSight, Spend Visibility provides instant access to pre-built dashboards (Figure 2 – Spend Visibility Dashboards with KPIs and Interactive Visuals) that go beyond traditional transactional reporting. Spend Visibility includes the summary of key performance indicators, and individual dashboards for spend broken down by category, department, region, month, supplier, and more. These dashboards are created automatically for you and are customizable. You can easily drill down to any level of detail, create your own analyses or dashboards, and share them with your executives and users. Spend Visibility helps you keep track of budget targets, business goals, and Guided Buying policy performance, enabling you to create or update Guided Buying policies based on data. In addition to managing your spend, you can also help your suppliers improve their performance and better meet your business needs with user procurement feedback on product quality, reliability, and performance benchmarks. Are these features primarily suitable for large customers? No, they help small businesses as much as large businesses. As an SMB, we know every minute of the day is valuable. With Business Prime, you get access to fast, free shipping on millions of items to help save you money, and you get tools like Guided Buying and Spend Visibility to help you save time. As a small or large Business Prime member you get two innovative features – Guided Buying and Spend Visibility – that work well together. They help you manage your policies, delight your users with the Amazon experience, and manage your spend with less effort, time, and cost. Within a day of signing up for a new account, you can on-board your users, set up Guided Buying policies, and start managing your spend. And, of course, with Business Prime you get fast, free two day shipping on over 100 million eligible items. Visit Amazon’s Business Prime page and get started today. Sundar Raghavan is the Product & Tech Director for Amazon Business. With more than 20 years of product development and management experience, he most recently spent five years at AWS building and launching Amazon RDS, DynamoDB, and QuickSight services. He previously held positions at Google (Postini), SAP Ariba (TradingDynamics), Oracle Hyperion (Arbor) and MicroStrategy.